Since the early 19th Century guests from around the world have travelled to Niagara Falls and to experience the wonder and majesty of the mighty Falls. Travellers in the early 1820’s were the first to experience the Niagara Falls as a tourist district. The first guests to Niagara Falls probably would have stayed at the Clifton House, the first luxury hotel in the area. Considered a summer hotel, it quickly gained notoriety as a host of concerts, events, and during the closing years of the American Civil War, Confederate Agents stationed in Canada often held meetings at the house. It’s superb location at the base of Clifton Hill, and steps from the Falls, would years later become the current home of the Sheraton on the Falls Hotel. Tourism in Niagara Falls suffered a major loss when the Clifton House was destroyed by fire in 1898. 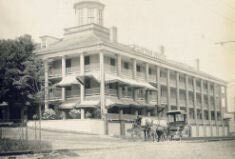 The site held much interest for local entrepreneurs, and the hotel was rebuilt in 1905 as the Clifton Hotel. The hotel garnered the same outstanding reputation as it’s predecessor held, however it also shared the same fate. 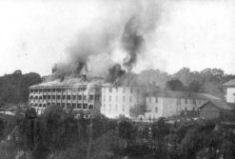 The Clifton Hotel was lost in a spectacular fire on New Year’s Eve 1932. It wasn’t until 1966 that the Sheraton was introduced to the Niagara Skyline as the Sheraton Foxhead Inn. The 14 storey hotel was enlarged, and expanded upon in 2000 to become the 22 storey 4-Diamond Sheraton on the Falls Hotel. As the Cornerstone of the largest resort property in Niagara, the Sheraton on the Falls Hotel is home to thrilling attractions, award winning theme restaurants, and one of a kind shops and stores.